The writer/director and star of hit horror films The Collector and The Collection team up again for another wildly effective and ruthlessly nasty trapped-in-the-house thriller, that could almost be the third in the series. 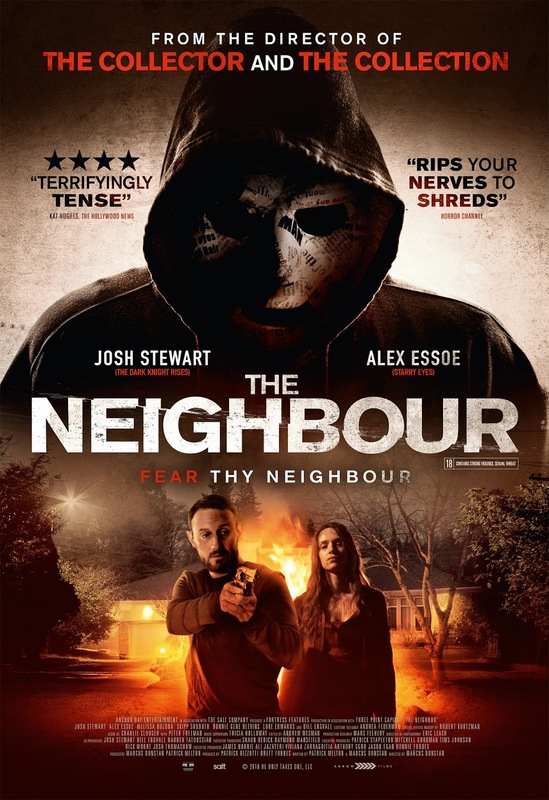 As before, director Marcus Dunstan puts his star Josh Stewart through hell as a war vet fighting to save his girlfriend from the clutches of a truly dangerous maniac. Dunstan, scripter of no less than four films in the Saw franchise, is the go-to guy for nerve-stretching, shriek-inducing thrills – and The Neighbour provides plenty of those, as well as some of Dunstan’s most imaginatively realised kills, including death by camcorder and death by rotting meat. Stylishly shot and adrenalised with a sleek soundtrack from Saw composer Charlie Clouser, the film starts with a bang and builds to a deliciously nasty fightback finale that’ll make you think twice about moving next door to anyone ever again. The film boasts two fantastic lead performances, from the underappreciated Stewart (soon to be seen in David Michod’s War Machine), and star on the rise Alex Essoe, brilliant in the 2014 psychological thriller Starry Eyes, and with a lead role in Simon Rumley’s forthcoming Fashionista. In a rare straight acting role, popular US TV comedian Bill Engvall is the murderous Troy, who imbues the line “we all have our little secrets” with spine-tingling menace. Fans of Mother’s Day, Wolf Creek, Straw Dogs and The Texas Chain Saw Massacre are in for a blast with this pitch black rural noir, ninety minutes of deep-Southern fried, blood-spattered mayhem that doesn’t let up and never lets go. In the small town of Cutter, Mississippi, army veteran John and his wife Rosie live on a run-down ranch, dreaming of one day escaping to Mexico. To raise the cash John runs illicit errands for his uncle. On the day they plan to finally leave Cutter, Rosie disappears. John thinks his mysterious neighbour, Troy, might have something to do with it, and breaks into his house that night. Thinking that his mysterious neighbour, Troy, might have something to do with it, he elects to investigate, but discovers a secret far more sinister than he could ever imagine.